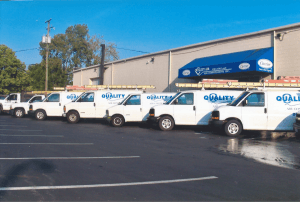 Quality Air Heating and Air Conditioning is a full-service HVAC company that provides homes in Delaware County, OH with the quality installation, repairs, maintenance, and more they need for comfort throughout the year. We also offer HVAC services to local businesses. All of our team members believe in the importance of honesty and integrity combined with skill to see that our customers receive the highest quality service on each and every job. If you’re in need of a new air conditioning system, or your gas furnace won’t turn on, you only need to contact us and we’ll take it from there. We offer the heating and cooling services you need to keep your home comfortable year round! Winters can often be harsh in Delaware County, OH. It takes a powerful heating system in sturdy shape to fend off the cold temperatures from a home. Quality Air Heating and Air Conditioning is more than capable of handling whatever heating services it will take to maintain comfort in your household. We install and replace gas furnaces, electric furnaces, and heat pumps, and provide 24-hour emergency repairs so you won’t need to worry about sudden heating breakdowns. Also ask about our regular heating maintenance plans. You probably have a furnace working to keep your home warm during winter. You should only entrust professionals to work on a furnace, whether installing it or fixing even the most minor problem. We have 24-hour repair work for both gas and electric furnaces, as well as any other service that you may need when it comes to residential furnaces. A heat pump works very much like an air conditioner, except that it can reverse the direction it operates so that it can bring heat into a home. Heat pumps are excellent “two-in-one” comfort solutions and can help save energy during the winter. Our technicians are experienced with heat pump installation, replacement, repairs, and routine maintenance, so give them a call today. It’s an unfortunate truth that air quality inside houses today is often worse than it should be. However, there is help. Whether you need to dehumidify your house or clean out unhealthy particles circulating through the rooms, you’ll find the ideal solutions with our indoor air quality team. We install and service air filters, air purifiers, humidifiers, dehumidifiers, and much more. A muggy summer day or a dry winter night can mean extra levels of discomfort in your home-not to mention health issues and damage to surfaces and furnishings. Striking the right balance of relative humidity inside a home requires that professionals install a whole-house humidifier or humidifier (sometimes both) that will see that you have a comfortable level of moisture in your home all through the year. Electronic air purifiers are among the most powerful air cleaning devices available. While mechanical filters can do an effective job at stopping larger pollutants like dust and dander, an air purifier will target the more minute particles that often escape filtration. Talk to our IAQ specialists to find out what combination of filters and purifiers will give your household the healthy air it deserves. Looking for Air Conditioning Services in Delaware County, OH? Making it through summer takes a central air conditioning system that’s always ready to work when you need it-and work without draining too much power. One of your top options for great cooling is to contact Quality Air Heating and Air Conditioning. We offer comprehensive service for air conditioning in the area: new installation, replacements, routine annual maintenance, and fast and effective repairs as you need them. Never go with amateurs when it comes to something as important as keeping your family comfortable! We understand that it’s a major emergency when your air conditioning system goes on the fritz during a hot day. We have repair technicians on-call 24 hours a days to help out. If you have a less pressing AC repair need, we are also the people on whom you can depend to diagnose the issue and have it fixed. The size and complexity of the heating and cooling systems for commercial buildings make them impossible to accurately service without specialized training. But Quality Air Heating and Air Conditioning has the experience necessary to care for whatever commercial HVAC services you require in Delaware County. No matter if you’re looking to have new rooftop units put in for your office building or the heating system that warms up your retail store needs to be fixed, the right help is only a phone call away. As with residential HVAC systems, you can always rely on our skill and experience when you need to have repairs for your commercial HVAC system. You never want to delay should you discover that the heater or AC that provides your customers and employees with comfort is starting to fail at its job. Pick up the phone and call us for fast repairs.